Last week, The Sims 4 team added toddlers as a free update after years of clamoring from fans. While I’m happy to see the life stage added, previous iterations of toddlers in The Sims didn’t do it for me. These new toddlers, however, change up the lives of my sims in significant ways. They also make it hard for anyone in the house to sleep at night, but that just seems true to life. I wasn’t all that upset when The Sims 4 launched without toddlers—the way they were implemented in The Sims 3 was pretty annoying. Essentially, the life stage was dedicated to teaching sims to walk, talk and use the toilet, and then dealing with the fact that they cried all the time. Relationships between toddlers and their parents didn’t feel meaningful, and toddlers only had a few actions they could do autonomously to keep them out of their parents’ way. The life stage felt so insignificant that once I discovered that I could keep the parents awake all night via cheating, I’d make them stay up all night to teach the toddlers all their skills in a single day. But toddlers in The Sims 4 are meaningfully different. You’re still incentivized to teach them how to walk and talk on their own, but the way their needs interact with the mood system changes the dynamic of the home they live in. If toddler sims get too tired and aren’t put to bed by a designated caregiver, they get angry and throw tantrums. If they aren’t having enough fun or haven’t played with a toy in a while, they get sad and start crying. The new household I added a toddler to hasn’t had a good night’s sleep in a few days. Learning to walk, talk and poop in a toilet have also been turned into multi-level skills, whereas in the previous game they were one-offs, more a status bar to fill than anything else. At level three of the communication skill, my toddler has learned to talk. But she still has a ways to go before mastering speech, as well as walking or her personal hygiene. It feels a lot more like my sim is passing through a developmental age, with all the highs and lows that entails, rather than just being an annoying, crying object. While I was playing around with the update, I kept thinking about a colleague, who’s just had twins. While his kids are newborns and still kinda look like smush-faced burritos, this updated Sims 4 reminded me that in a few years he’ll be dealing with two children that are both discovering their autonomy and can’t poop on their own. He’ll be dealing with his own sleepless nights and crying fits and constant demands, as well as a barrage of first memories. 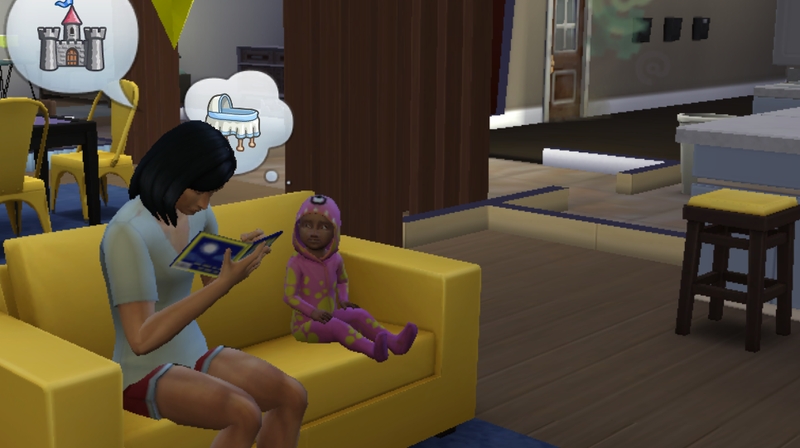 If nothing else, The Sims 4 toddler update makes having a kid seems like a job unto itself, and it reminds me that children really are little people who are growing into their own. It’s also reminded me that I don’t want to have kids for quite some time. I really do love sleeping.